Under pressure from the IMF, the Eurozone leadership is desperately looking for ways to restructure the Greek government debt in a politically "acceptable" way. 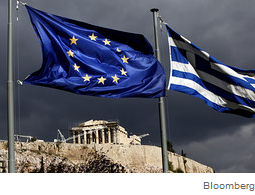 The IMF has been calling for some form of relief that would put Greece on a more sustainable path. 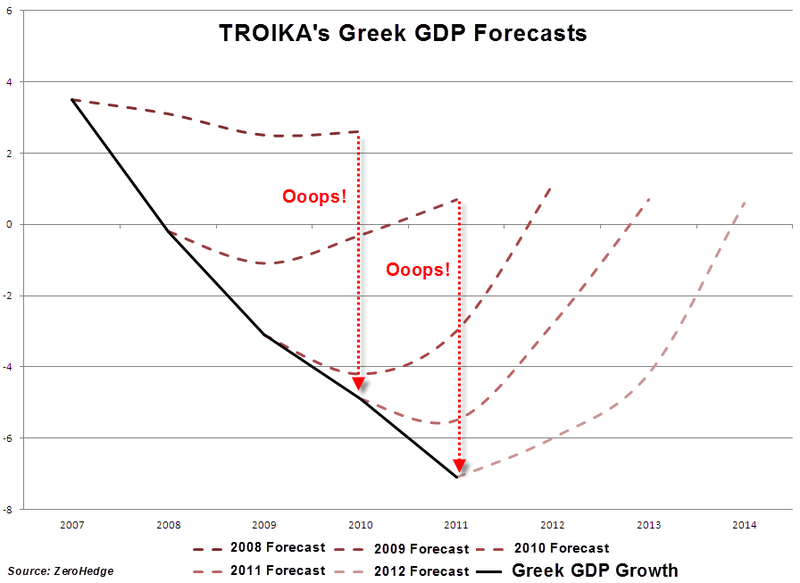 The troika forecasts for Greek recovery in the past have been nothing more than exercises in self deception (see chart from Marc to Market). Realistic estimates put Greek debt at double the GDP some time in 2014 unless there is a restructuring. The IMF charter simply prohibits the fund from providing support to nations without at least some reasonable expectation (even an optimistic one) of recovery. Lowering rates and extending maturities seems to be the most palatable solution so far. Businessweek: - “I have preferences and that means no fresh money because it is difficult to explain to our taxpayers,” Austrian Finance Minister Maria Fekter said. She predicted a “mixed package” that could include lower rates, though countries with higher borrowing costs like Spain and Italy would want compensation for any losses on lending to Greece. And that's one of the places the situation gets sticky. Italy and Spain say they are not in a position to take losses, even if these losses do not involve loss of principal. While funding Greek bonds, Italy and Spain would be paying more in their own borrowing costs than they would receive from the reduced Greek debt coupon. These nations are now pressuring Germany to compensate them for whatever "Greek pain" they may endure. GS: - German government may be asked to compensate other governments for additional Greek financial support. Reducing interest payments for the Greek government would be one way to narrow the funding gap that has opened up. Lower rates, however, would imply that some governments, notably the Italian and Spanish governments, would have to pay higher rates in funding the Greek help than what they receive in interest payments from the Greek government. One solution, according to press reports, would be that the German government compensates these governments, to some extent at least, for the interest spread. It is not clear whether such a solution would be acceptable to the German government. But it suggests that some difficult questions still need to be answered before the next tranche can be paid out. It is difficult to imagine the German government telling its citizens that not only is it easing the terms of Greek debt, but the taxpayers are also compensating Italy and Spain (and possibly other nations) for their share of losses. The Greek restructuring numbers are actually relatively small, particularly compared to Germany's government budget. But it is not as much about the numbers as it is about politics. With less than a year before the next general election in Germany, a Greek solution is critically important. At the same time the solution German voters would prefer can not involve additional taxpayer resources (or at least perceived as such). So the Eurozone leadership continues to dig for other sources of funds. Everything seems to be on the table, including raiding the profits made by the Eurosystem (the ECB and NCBs) on Greek debt. There is even talk of the ECB returning future interest payments on the Greek bonds it holds back to Greece. This is unlikely to be sufficient, but is certainly easier to sell to the voters. Businessweek: - Finance ministers are also considering how to tap profits made by the ECB and national central banks on Greek bonds, drawing on a February commitment to recycle that money back to Greece. The question of how to treat future ECB profits also has to be addressed. In spite of dire economic conditions, Greece actually stands a good chance of turning its economy around if the debt burden is reduced (see discussion). The Eurozone has to find a restructuring solution if Greece is to be part of the EMU going forward. And Germany may need to step up once again. As of today, Angela Merkel seems optimistic: “I believe there are chances, one doesn't know for sure, but there are chances to get a solution on Monday...” This should make for an interesting weekend in the euro-land.